Since 1847, The Grand has maintained a gracious tradition of Southern hospitality on historic Mobile Bay. The Grand Hotel consistently receives the AAA Four Diamond Award and is a family-friendly historical hotel that is over 160 years young and was named a top family resort by Travel + Leisure and Zagat. Southern Living readers named it as one of their favorites. An active schedule of activities and special weekends is particularly attractive to families. Groups appreciate the superlative meeting facilities. With 405 luxurious guest rooms and having some of Marriott’s best spas, golf courses and pools, the Grand Hotel is now grander than ever. A $50 million renovation on The Grand was completed in 2003 and again in 2006. 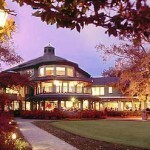 The Dogwood and Azalea golf courses were renovated in 2005. The Grand’s 550 acres feature giant live oak trees, multiple beaches and lush landscaping. A military salute and cannon firing takes place each day at 4:00 p.m. and is followed by afternoon tea in the hotel lobby. In addition to world-class golf and the 20,000 square-foot spa, the resort has a variety of activities including eight Rubico tennis courts, a croquet lawn, horseshoes, bikes, kayaks, sailboats and other watercraft for the guests’ enjoyment.